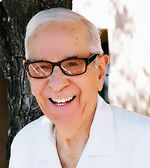 Samuel Flores returned to his heavenly home on April 8, 2019. He was born to Porfirio and Francisca Flores on January 4, 1929 in Colonia Dublan, Chihuahua, Mexico. This is where he spent his childhood, raised by his grandmother Elizabeth (Grandma Lizzie) Haws after his mother passed away when he was 4 years old. He graduated from Academia Juarez in Colonia Juarez Chihuahua, Mexico. He was called to serve a 2-year mission for the Church of Jesus Christ of Latter-day Saints in the Mexico City, Mexico Mission. He returned with honor and married the love of his life Amanda Flores on January 23, 1952 in the Mesa Arizona LDS Temple. They were blessed with 3 children. He worked for many years as a manager and in sales for the Singer Company and New York Life Insurance Company to provide a Christ-centered, happy, comfortable life for his family. He was a faithful member of the Church of Jesus Christ of Latter-day Saints. He held many positions in the church. His most cherished and favorite calling was when he and his wife were called to be Mission President and Matron, initially in the San Salvador, El Salvador Mission; subsequently, due to political unrest in El Salvador, he went on to open the Honduras/Belize/Nicaragua Mission. They gained many missionary children and friends whom they served and dearly loved. He is survived by his children, Cozeth (Art) Krauel, Las Cruces, NM; Laura (Damon) Truitt, Vancouver, WA; Sergio (Lori) Flores, West Jordan, UT. 9 Grandchildren, Ben Krauel, Mellissa Krauel (Kevin Weaver), Erica Krauel, Las Cruces, NM; Ehran Krauel, Kenosha, WI; Lindi (Justin) Cox, Vancouver, WA; Devin Maxfield (Colleen Bailey), Portland, OR; Annica Maxfield, Vancouver, WA; Celestina and Iris Flores, Provo UT. 9 Great Grandchildren, Caden and Emily Krauel, Las Cruces NM; Ian Krauel, Davenport IA; Lydia and Zelda Jones, Davenport IA; Liam and Laila Weaver, Las Cruces NM; Vincent and Margaux Cox, Vancouver, WA. Sister, Gloria Rivas, Colonia Dublan, Chihuahua, Mexico. Brothers, Moises, Ruben, El Paso, TX; Helaman, Hector, Porfirio Flores, Colonia Dublan, Chihuahua, Mexico. Many nieces and nephews, brothers and sisters-in-law. Preceded in death his beloved wife Amanda of 48 years, brothers Efren and Elias Flores, and sister Celia Collins. He leaves behind many who loved him and will miss him very much. He was a great example of Christ-like love, kindness, service to others, and generosity. He loved and served the Lord and was grateful for the long life he lived. We will all have wonderful memories and were truly blessed and grateful to have had him in our lives. Funeral Service will be held Monday, April 15, 2019 at 2:00 PM at the Church of Jesus Christ of Latter-Day Saints, 3210 Venus, Las Cruces NM 88012. Interment to follow at Hillcrest Memorial Gardens, 5140 Picacho, Las Cruces NM 88005. To send flowers to the family of Samuel Flores, please visit our Heartfelt Sympathies Store.